While traveling might seem like a holiday to some, there’s come a point when long-term travelers actually need a holiday from their travels. And I think a beach holiday is just what I needed. 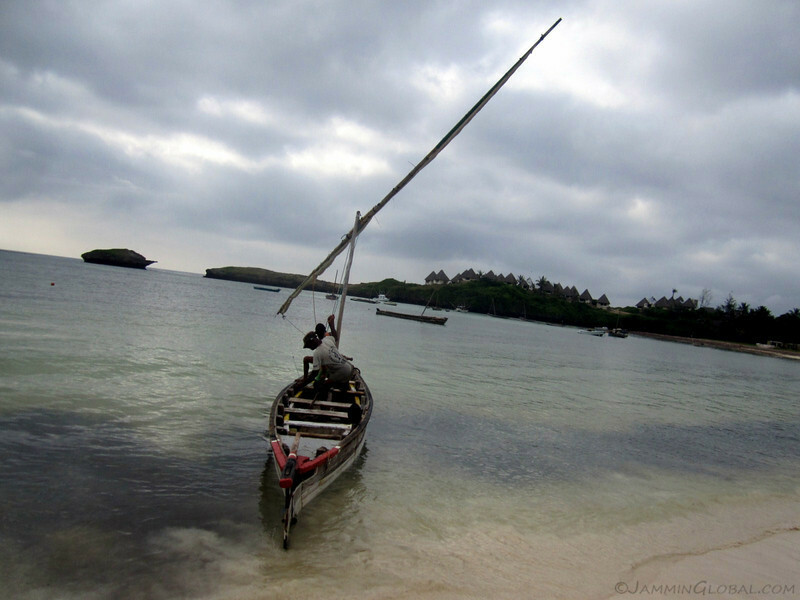 Christina, David and I headed down to the small fishing village of Watamu on the Kenyan coast for a few days of lazing on the beach before Christmas. 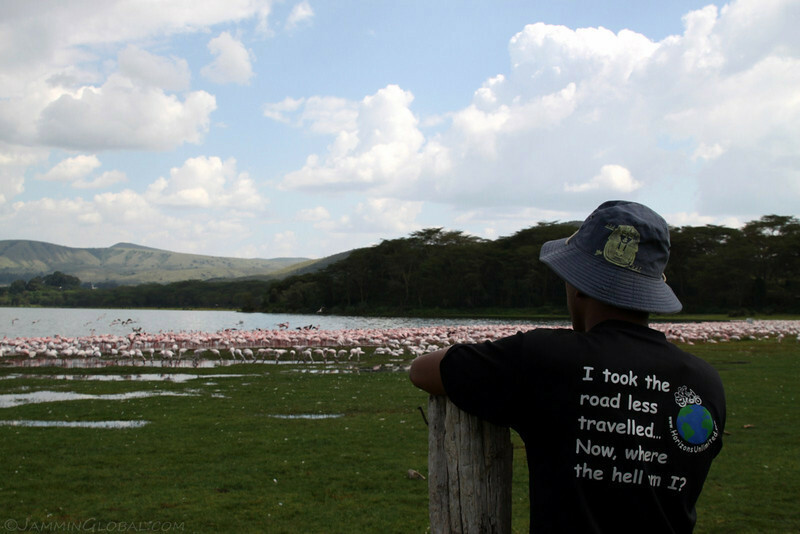 After that, with a different group of friends, I went to Naivasha for some cabin camping over Christmas, where we butchered a few chickens and went on a relaxing bicycle ride around Lake Naivasha. Road trip to the coast! David and Christina in a borrowed Mitsubishi Pajero iO. 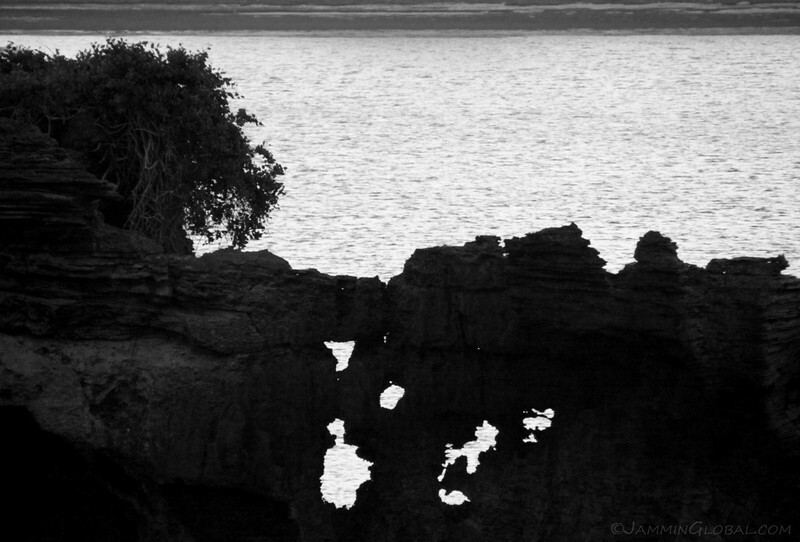 Beautiful baobab trees along the coast from Mombasa to Watamu. 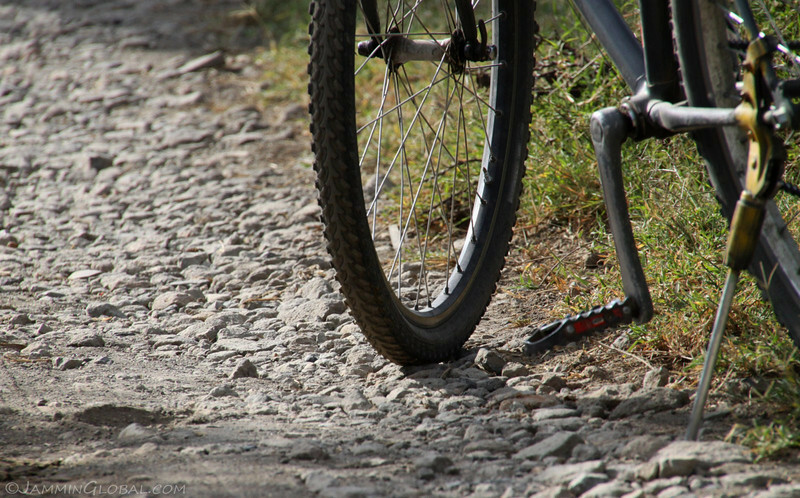 Traveling in Kenya with four wheels. 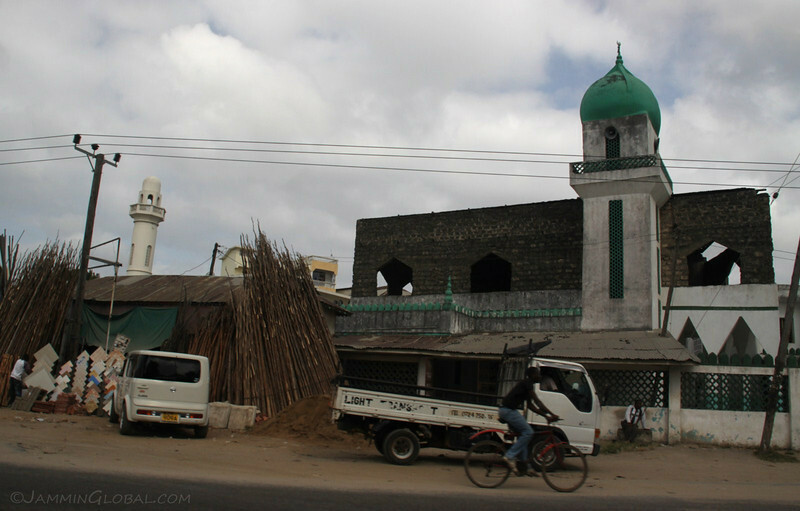 The brown route was our trip down to the coast, following the main highway till Mombasa and then turning north for Watamu, which is just south of Malindi. Click on it to go to the interactive version in Google Maps. We took a small short cut to avoid going thru Mombasa town and this dirt route was pot-holed in places. 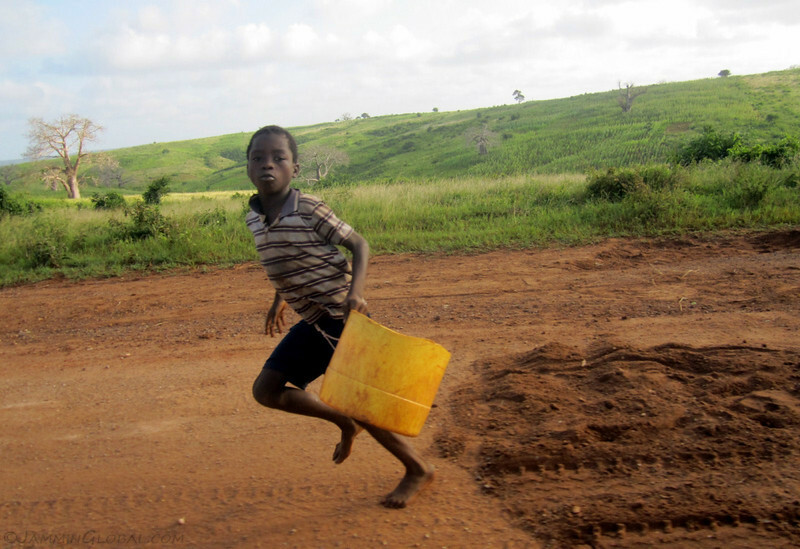 Local kids would wait with a bucket of dirt and once they saw us coming down the road, they would throw the dirt in the pot holes and then run alongside us, asking for a tip for repairing the road. 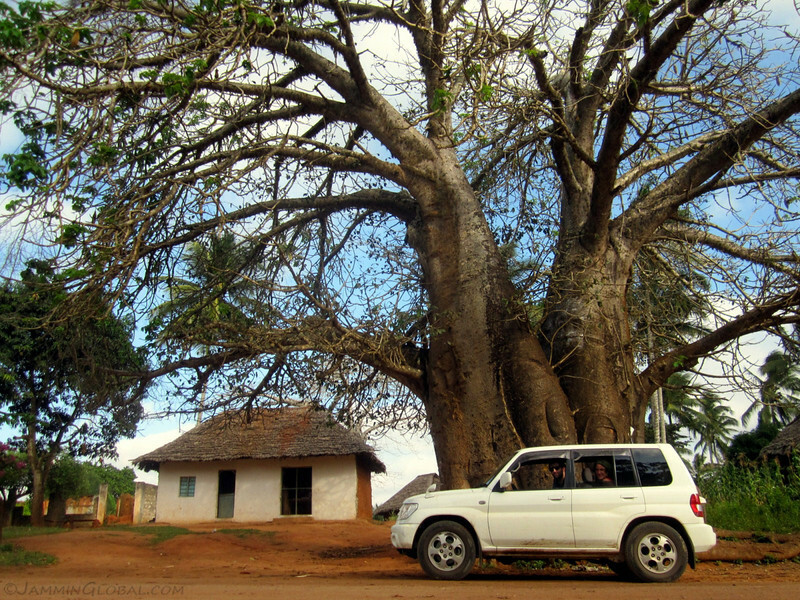 Baobab trees are iconic all over Africa and they feature in many local legends. 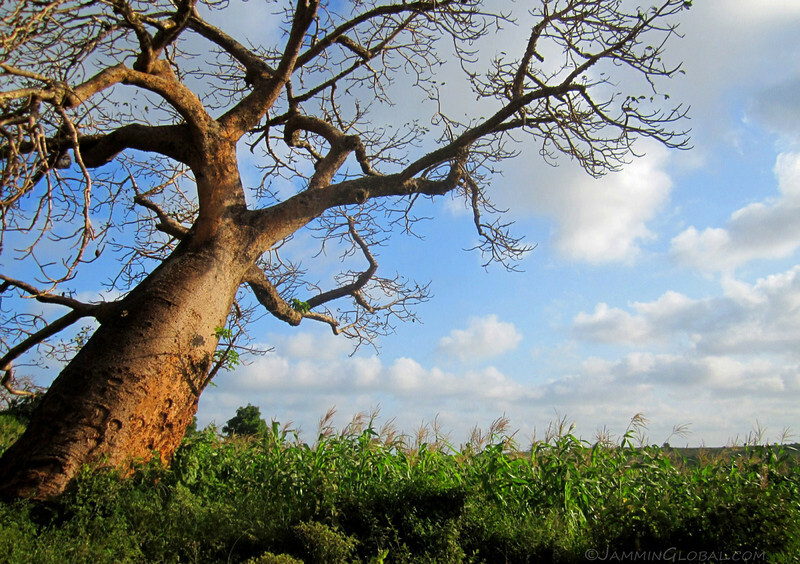 One goes like this: when the great spirit created all living things, the baobab tree got up and started walking around, frustrating the great spirit, who uprooted the baobab and stuck it back in the ground, upside down, giving it the roots-exposed look. 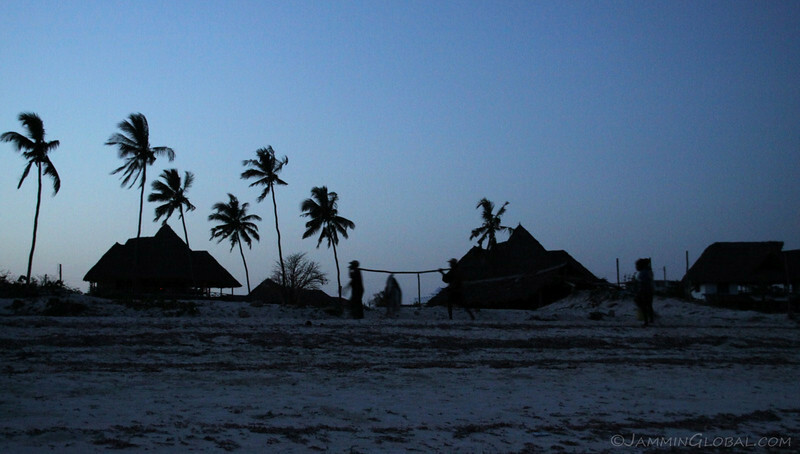 Ahhh, relaxing on the beach at Watamu. We stayed at a small guest house and found this thatched hut that was in the process of being made into a restaurant. The beach was patrolled by hustlers, also known as beach boys. These guys would approach tourists and get them anything they wanted, for a fee. 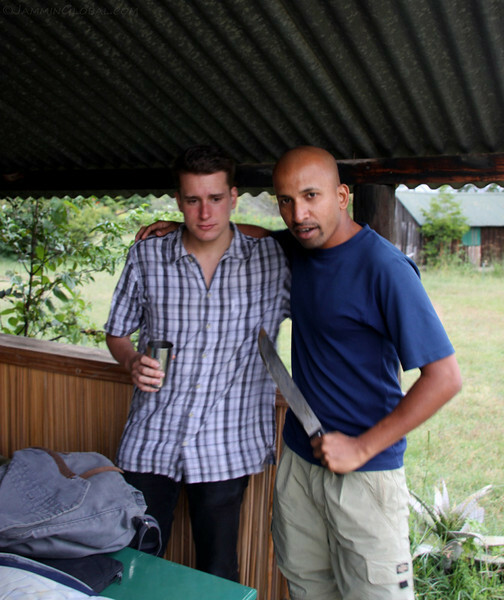 The first thing we got was a fish lunch, served in this hut. 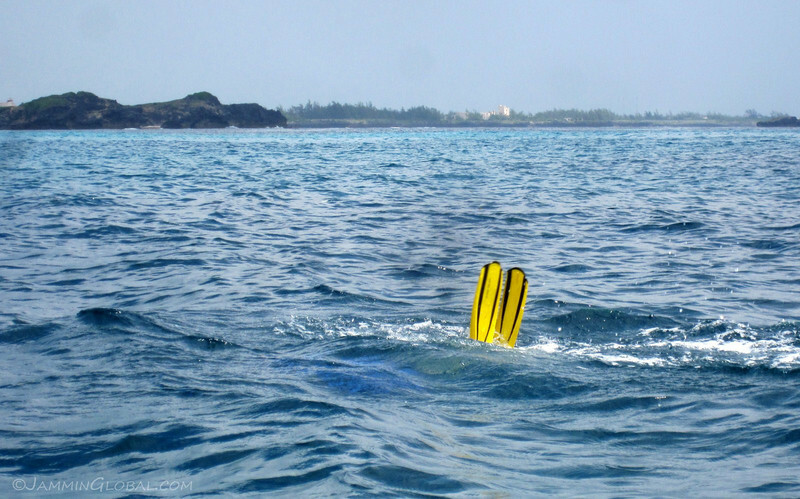 Then, our beach boy, Fanny, started pressing for a snorkeling and scuba diving tour. 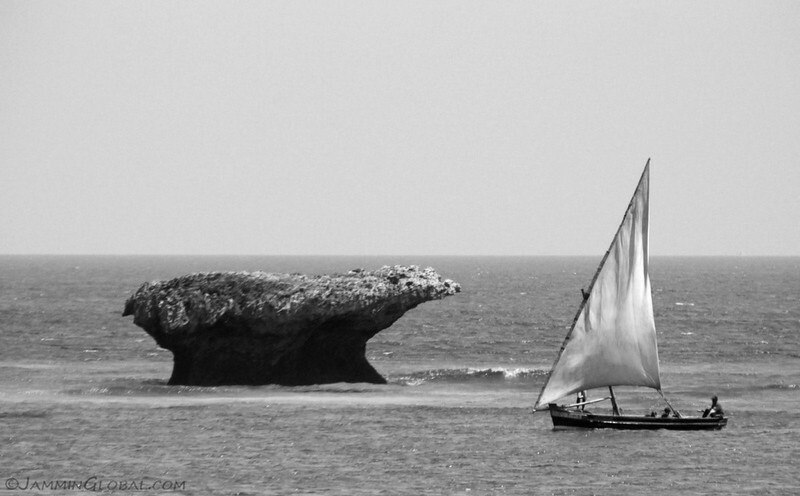 A fishing boat coming back to Watamu, passing an outcrop of volcanic crag that makes up the coastline here. 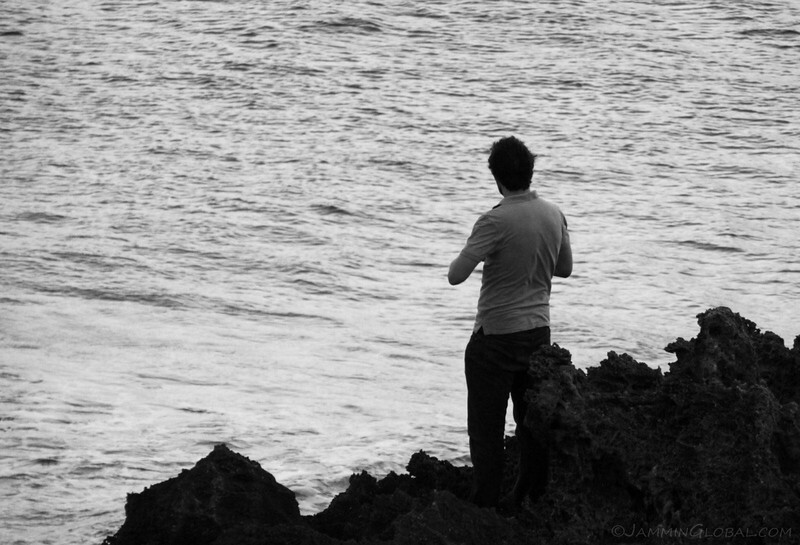 …that was gutted straight away on the beach. 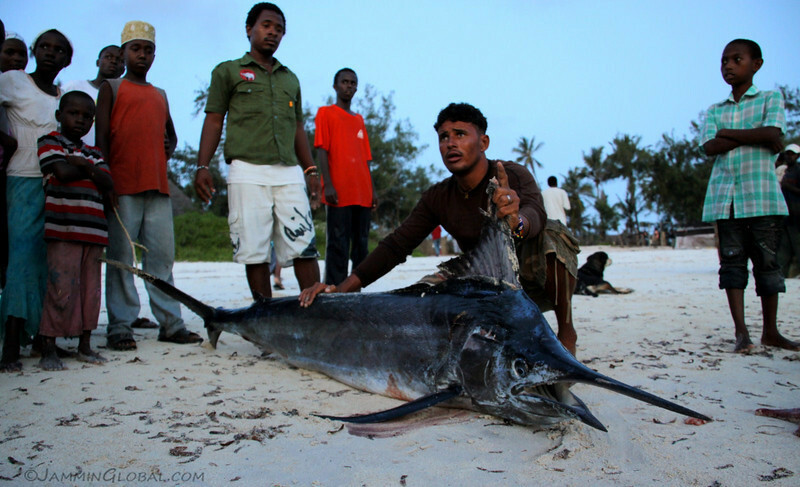 Everyone wanted to pose with this beautiful marlin. 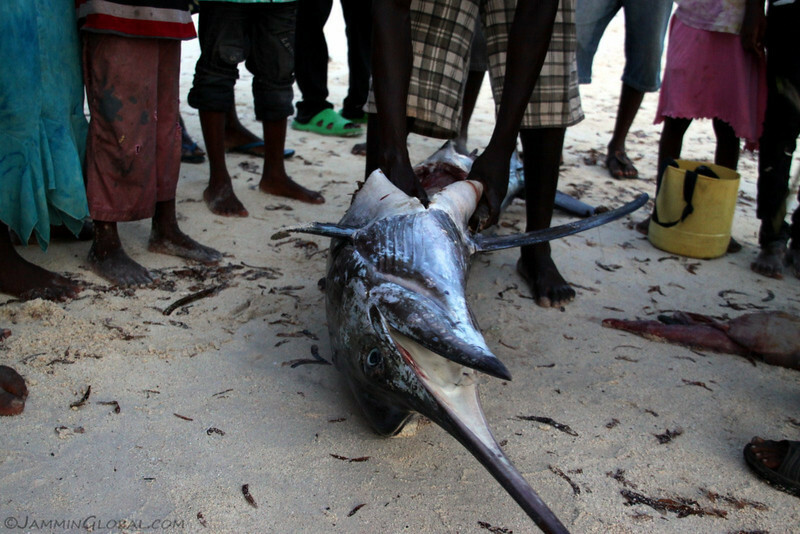 I asked the fishermen who was buying the fish and they said it would be one of the many resorts that catered almost exclusively to Italian holiday-makers. 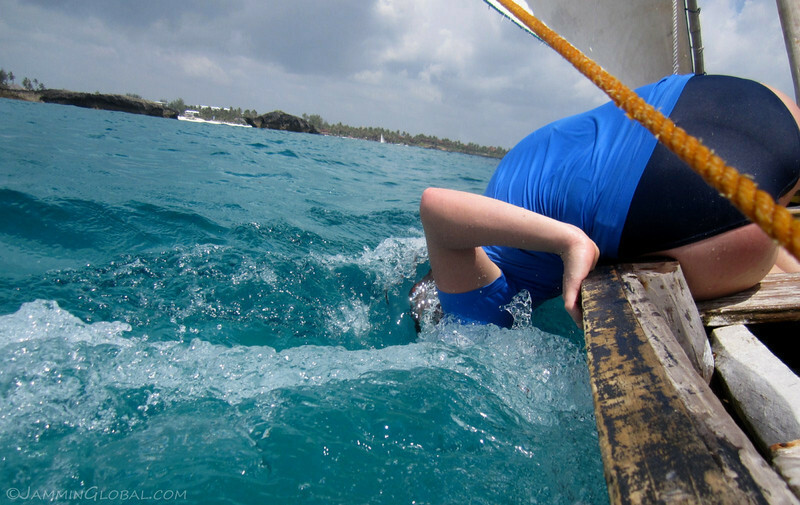 The next morning we used Fanny’s services to go on a low key snorkeling trip. 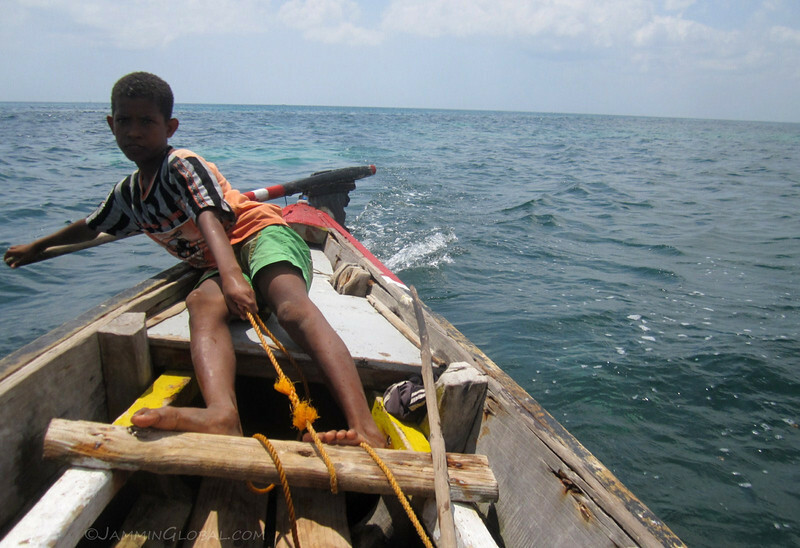 He secured us this dhow and said his father and younger brother would be manning the sail and rudder. 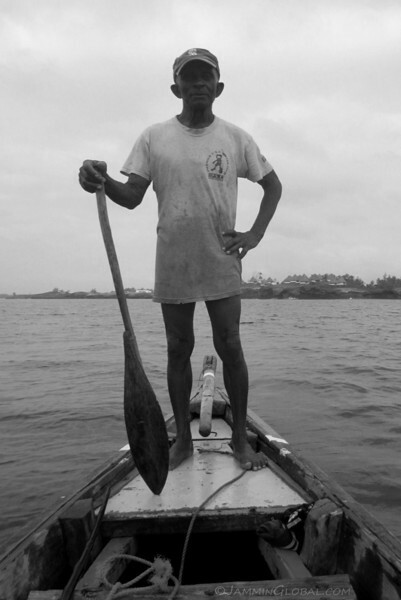 Fanny’s father looking very fit for his age, pushing us out to deeper waters. He spoke Kiswahili and Italian. I managed to communicate with him with my Spanish. 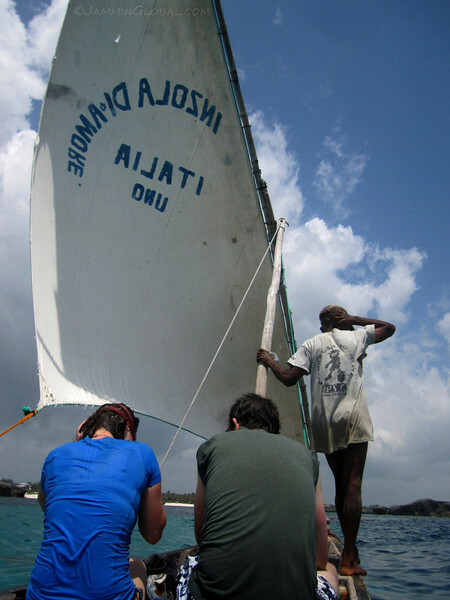 Riding a dhow in the waters off the Kenyan coast. Christina diving down to chase some fish. 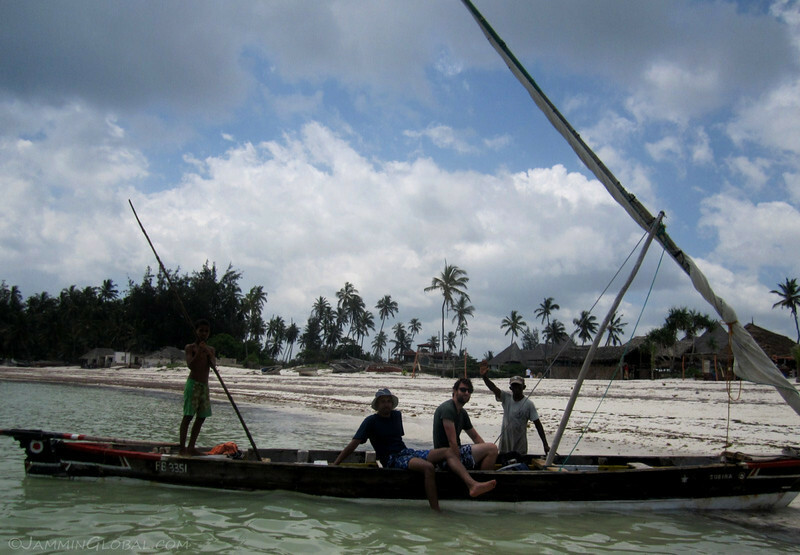 Back in the boat after some snorkeling and riding the winds of Watamu. Our captain was taking us to the different coral areas. Christina having a look under the water to see if it was worth diving in. Fanny’s little brother manning the rudder on our way back. Back to the beach after a nice morning out on the dhow. Fanny had a fish lunch ready for us when we got back. 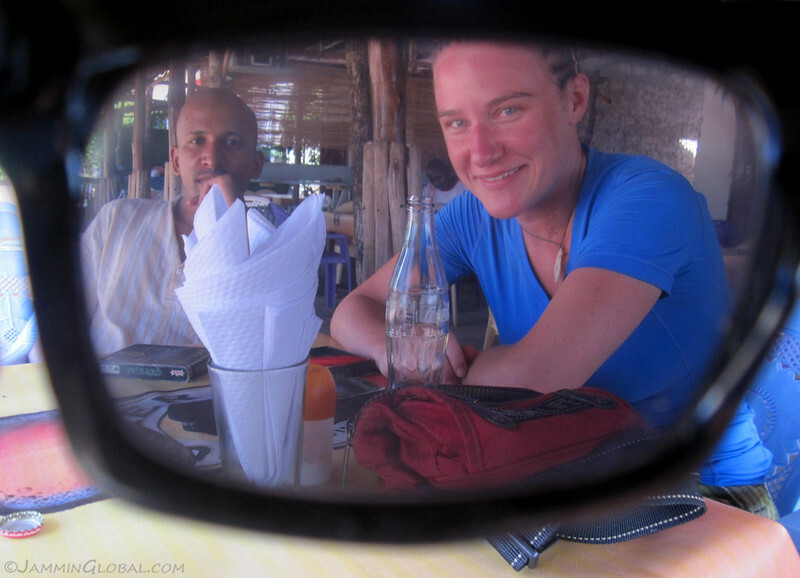 The dhow trip and lunch cost each of us Ksh1,200 ($13). 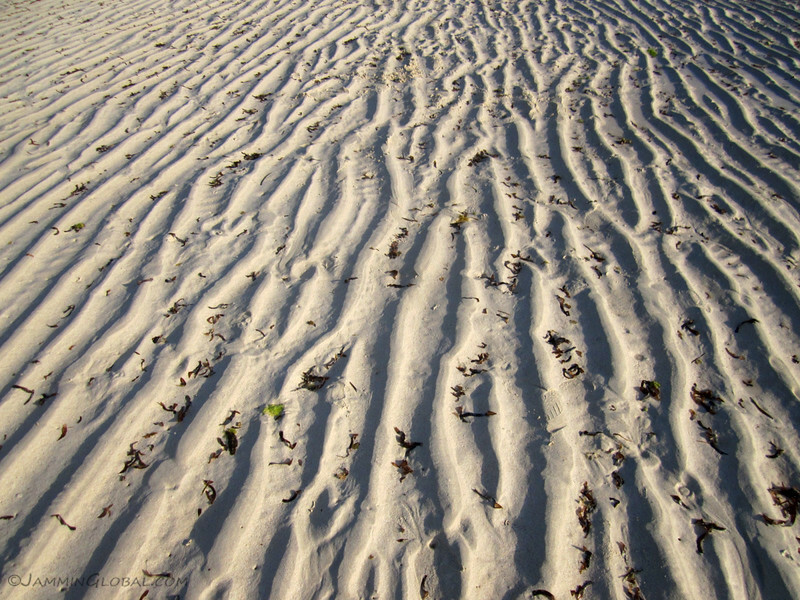 The retreating tides revealed stripes in the sand and allowed us to walk across to some rock outcrops for the afternoon. Next to us was an exciting natural show going on by these crabs. 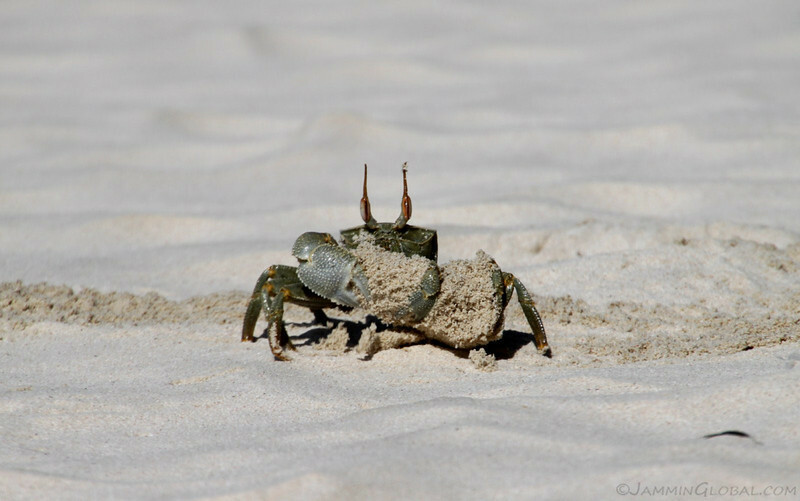 They stay buried under the sand until the tide goes out and then come up and start excavating their homes once more. 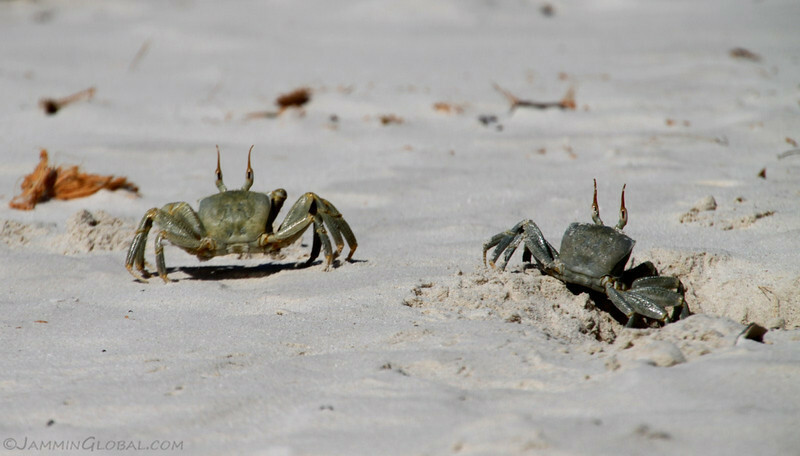 They walked sideways and held a stash of sand under one set of legs, which would get flung out away from their home. …fighting. 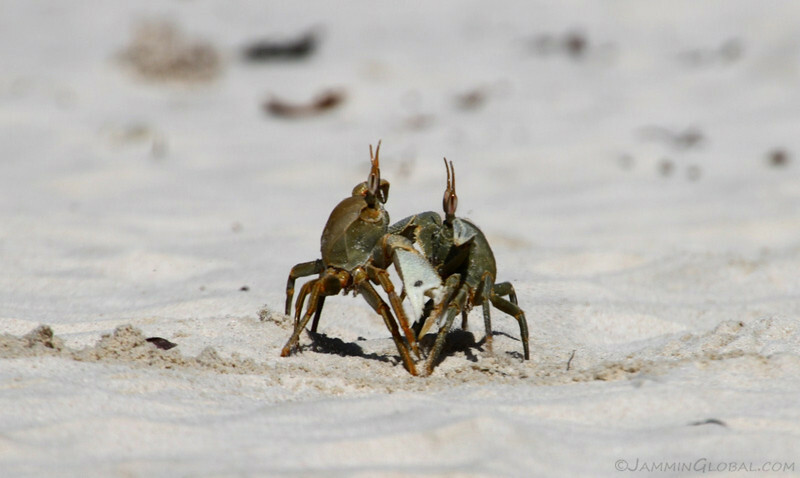 Crab Fight Club in Watamu. The stronger of the two would get the hole in the sand. 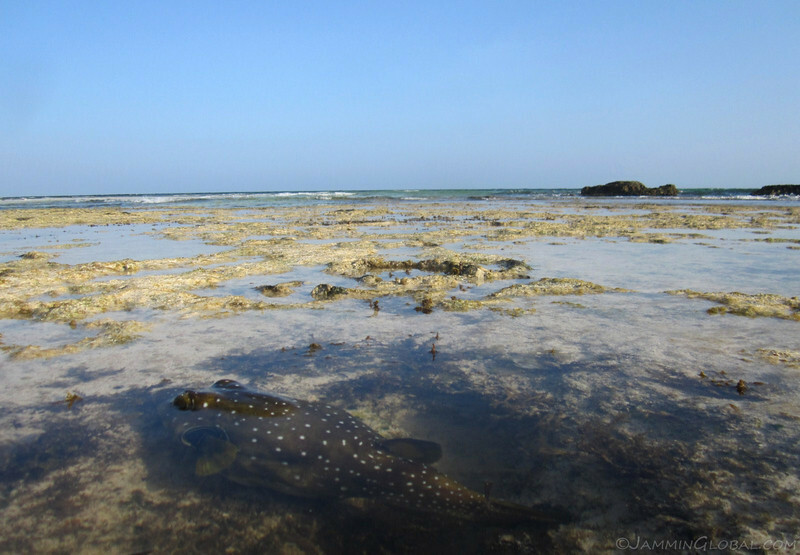 On our way back to the beach, we spotted this fish stuck in a sink hole, yearning for deeper waters way out there. 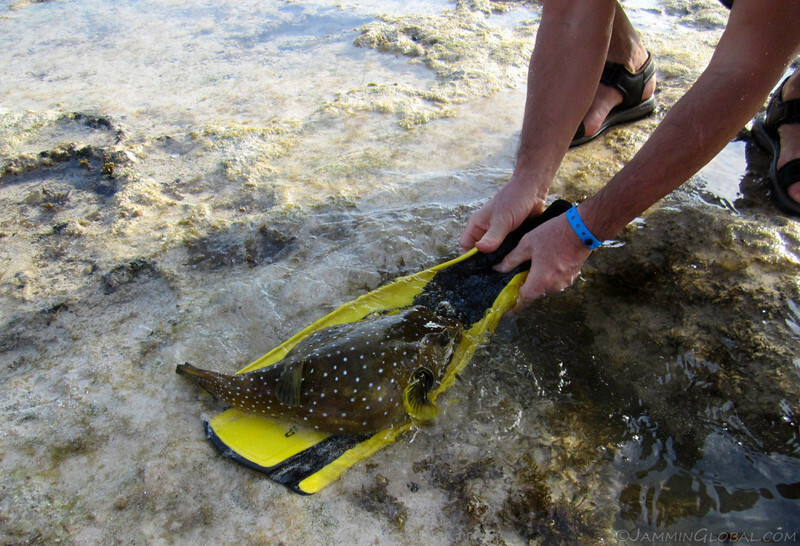 We used one of Christina’s flippers to rescue the fish and take him out to the sea. 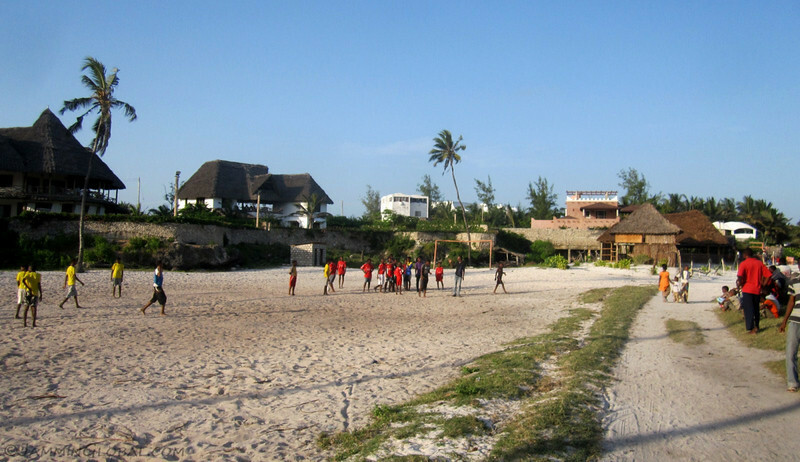 The public beach at Watamu with daily football practice. Fanny told us that Italian property developers were eager to buy up all the good land by the beach and build resorts for their clients, but the local residents were fighting back and wanted to keep the public beach open. They won their case but on condition that they had to develop the beach front, which resulted in this football pitch and the few thatched restaurants like the one we ate at. 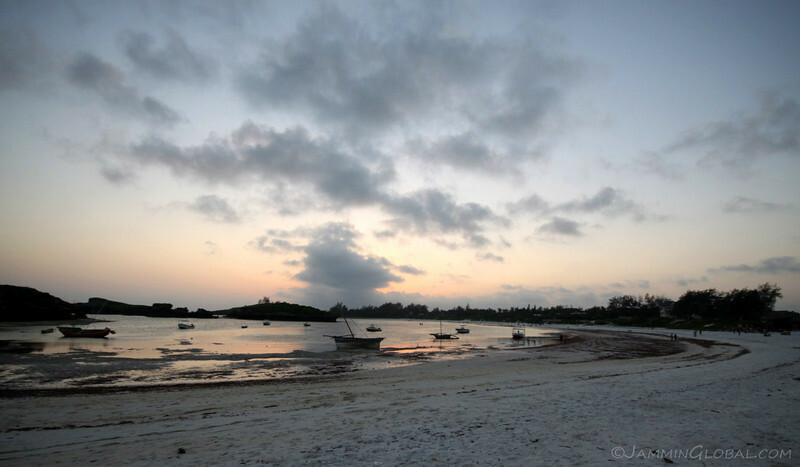 A beautiful end to the day in Watamu with its natural harbor. 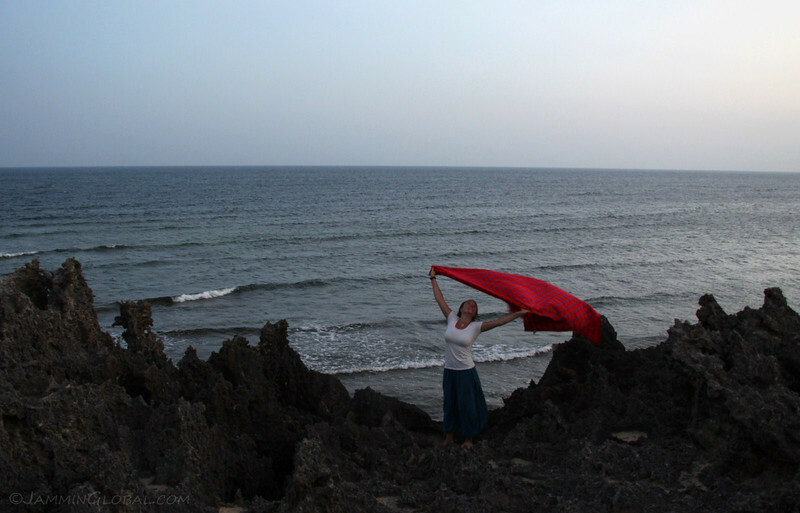 Christina flying her Maasai blanket in the strong breeze coming off the Indian Ocean. Windows in the rocks. Erosion slowly workings its way through this outcrop in the bay. 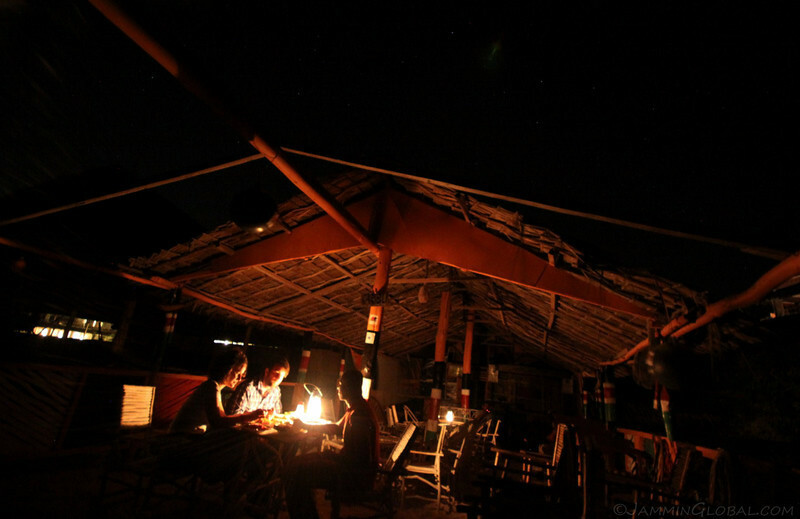 Enjoying an evening meal under lantern light at the beach. 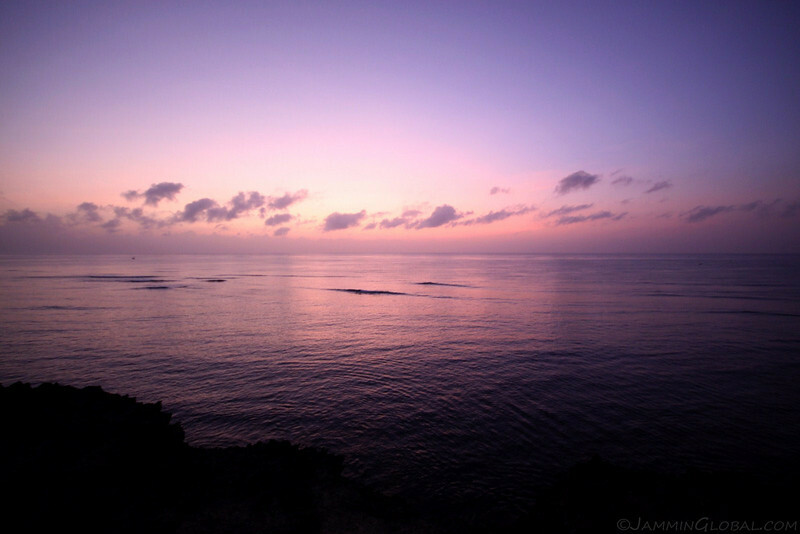 I woke up early to catch the sunrise and just at twilight, the moon was still high up in the sky. 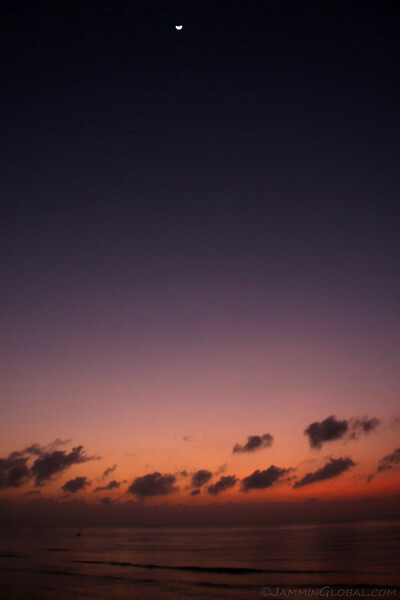 Something big and bright is coming up over the horizon, mixing its strong orange light with the blue hue of twilight. 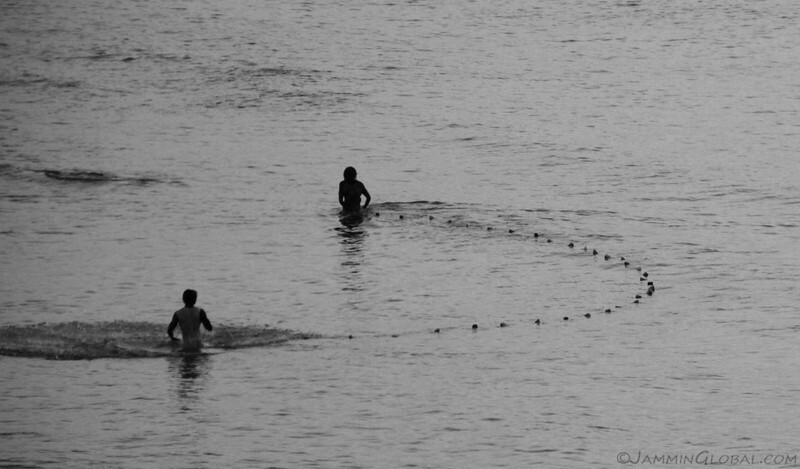 Fishermen wading out into the waters and casting their net. 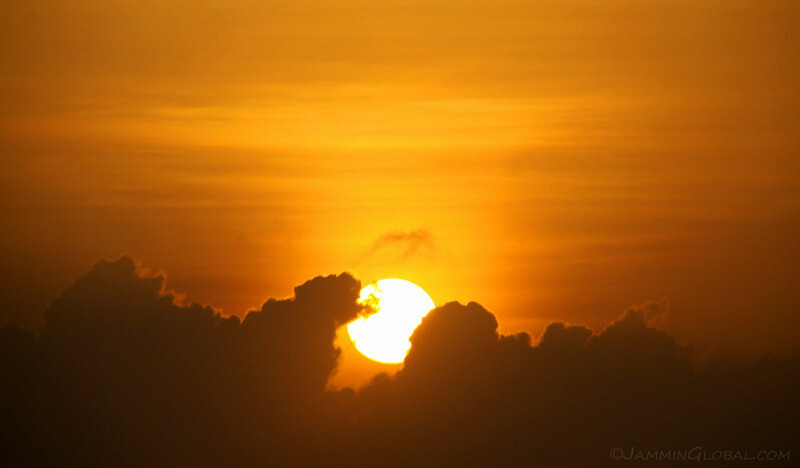 The Sun showing its face through the clouds on the horizon. 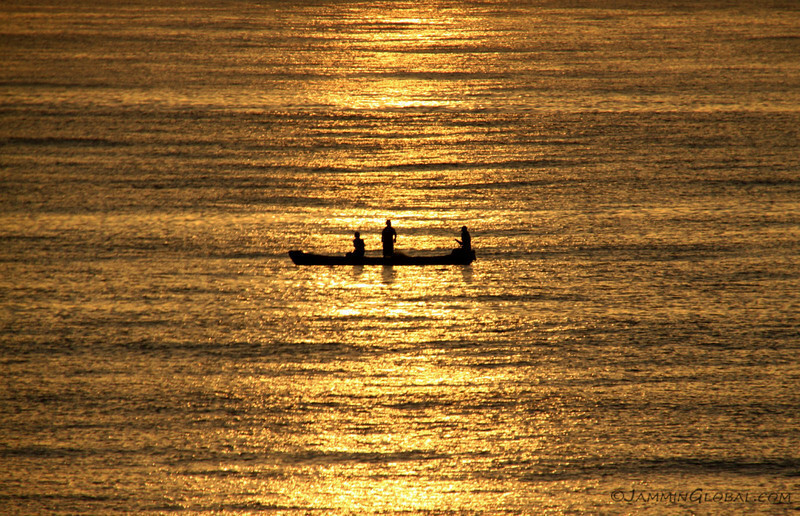 Fishermen’s shadows cast on the golden waters of Watamu. 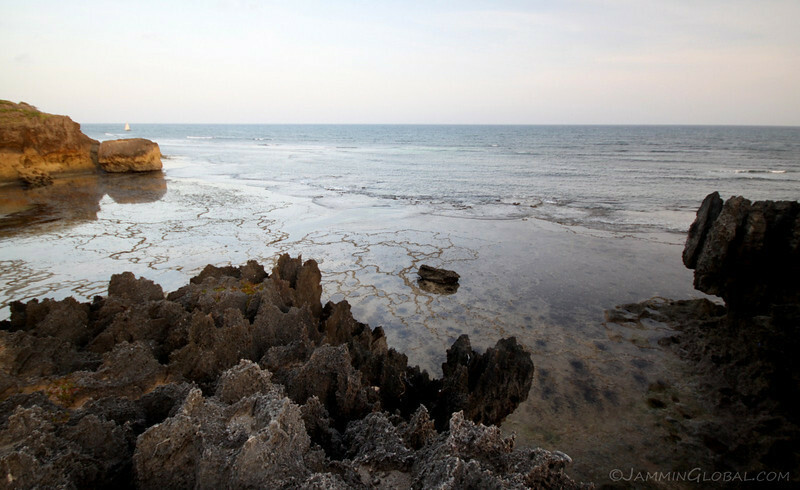 While Christina went on a scuba diving trip, David and I explored the coast north of Watamu and came across this surreal-looking beach, where it seemed that the land just blended into the ocean. There were no waves and the waters looked like they belonged to a lake and not the same ocean that we swam in just further south. David using his sunglasses to frame us for an artsy photo. Christina was beaming as she finally got to swim with dolphins at Watamu Marine Park. 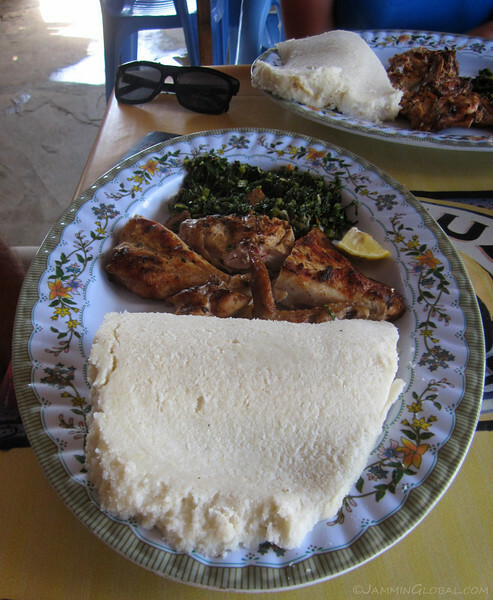 A hearty meal of a big slab of ugali (hardened maize porridge), grilled chicken and sukuma wiki (kale). 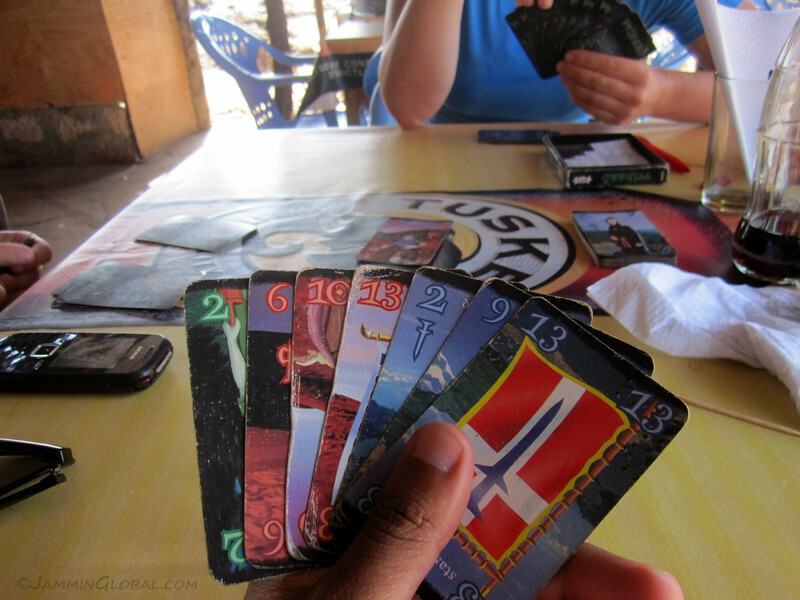 Wiling away the hot afternoon with a game of Wizard, which was similar to Uno. We played this almost non-stop during our beach holiday. 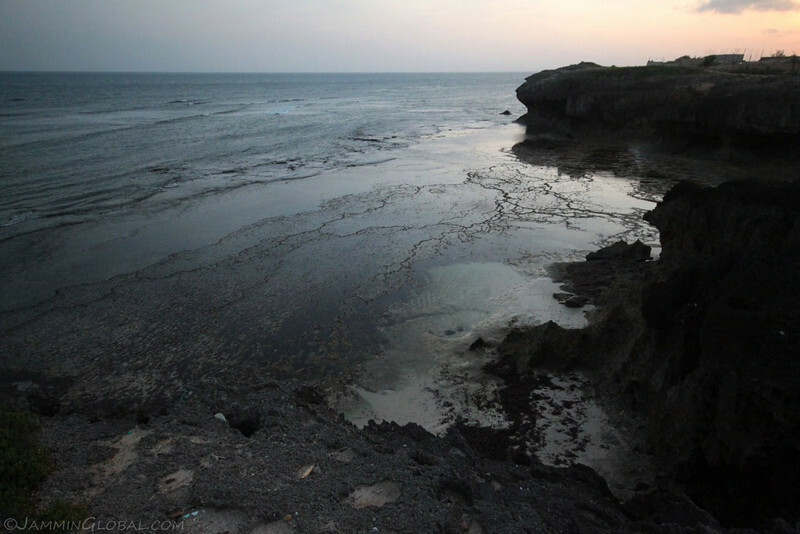 The tide was out and the sun was going down behind the craggy volcanic shores of Watamu. 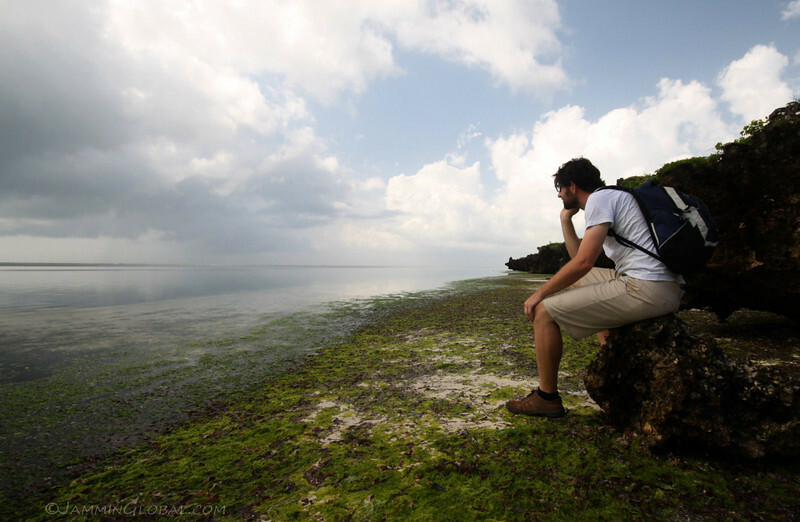 I really enjoyed the variety of beautiful coastline at Watamu and vowed to come back again. 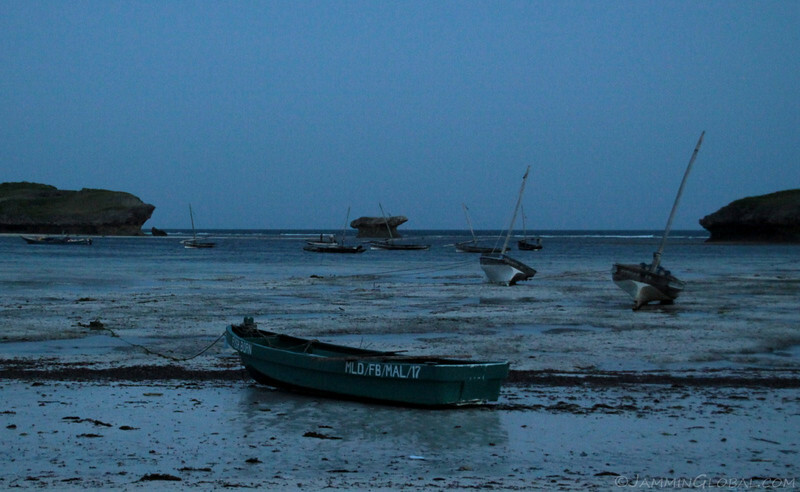 Marooned boats with nowhere to go until the tide came back in. 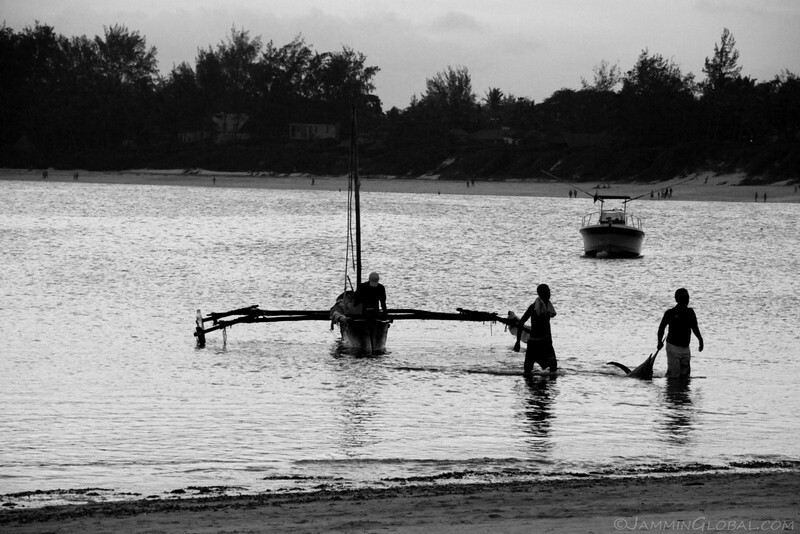 Fishermen carrying their catch into town as they walked in from the beach. 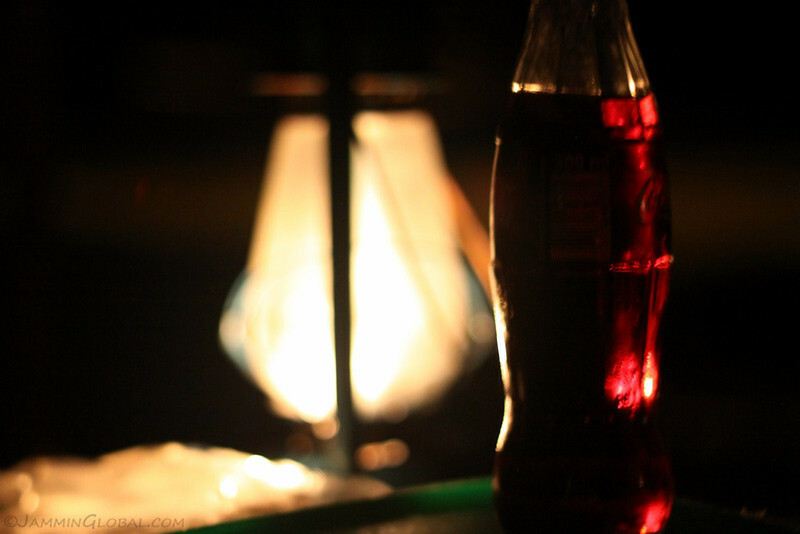 Enjoying another meal by the beach under lantern light. 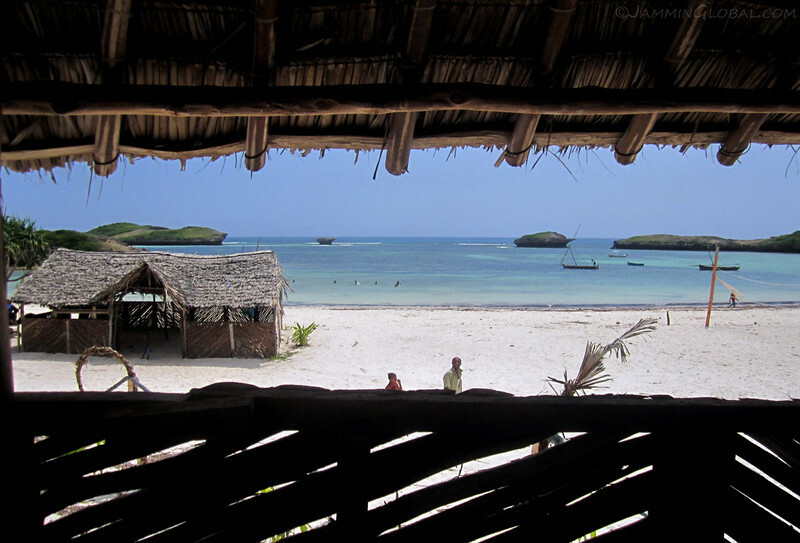 Most of the local beach restaurants shut down at sundown, but the owner of this place was willing to prepare a fish fry dinner for us for just Ksh200 ($2.15) per person. A 15 second exposure with my Canon 50D using a 50mm lens pointed at the sky captured Orion and some of his neighboring stars. 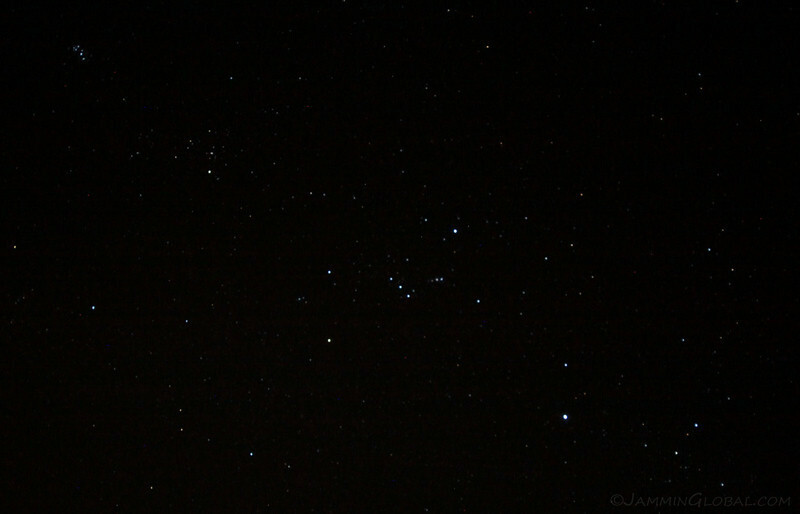 The Pleiades, or Seven Sisters, are in the upper right. Here on the equator, Orion appears sideways as he slowly rotates in the sky from being straight up in the northern hemisphere and having a sword to being upside down in the southern hemisphere and turning his sword into a tie. 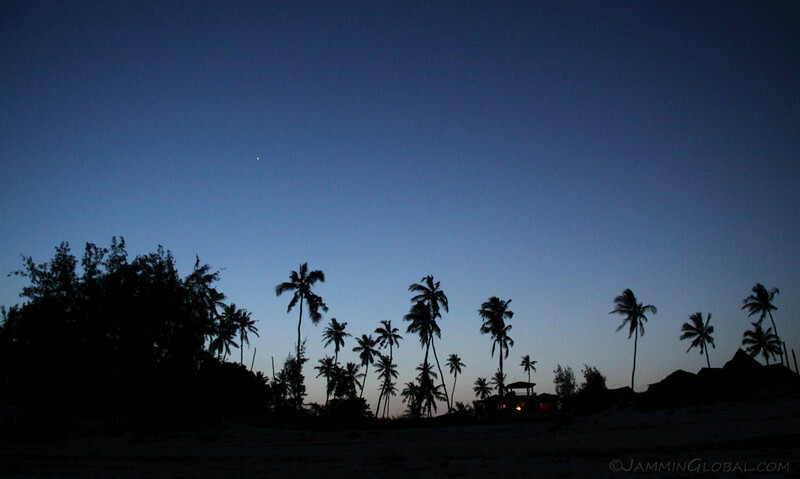 The end of a few lovely days lazing in Watamu, with Christina and David at Malob Guest House. Scenes from the road on our drive back. This was as we neared Mombasa. 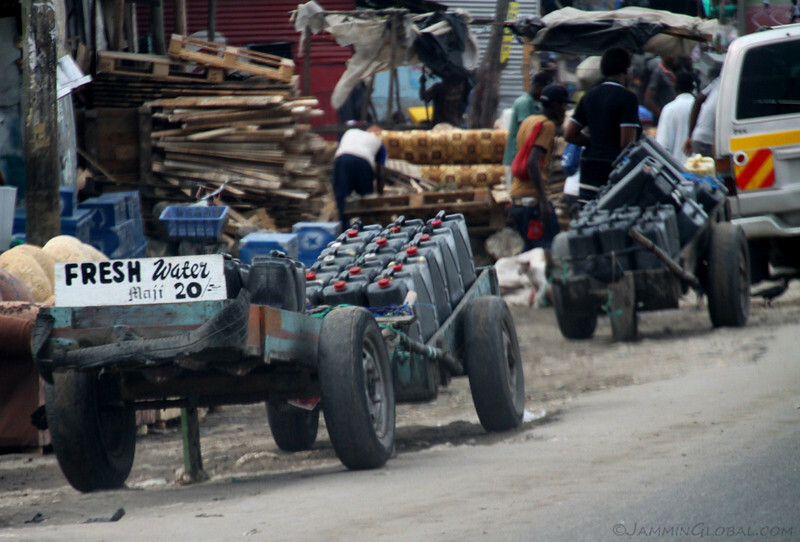 Water delivery of 20L (5.28 gal) jerry cans for just Ksh20 ($0.22). 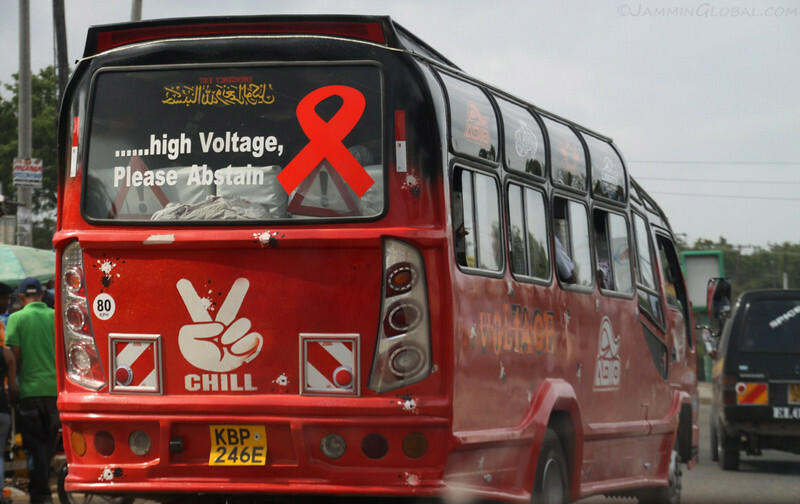 Mega matatus and their crazy liveries. 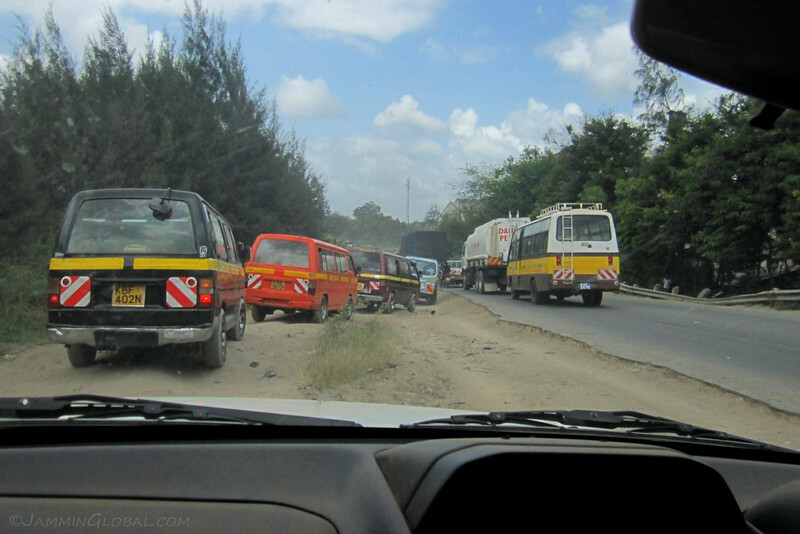 The road out of Mombasa was packed with trailer trucks and I followed the matatus as they navigated an off-road path next to the highway. 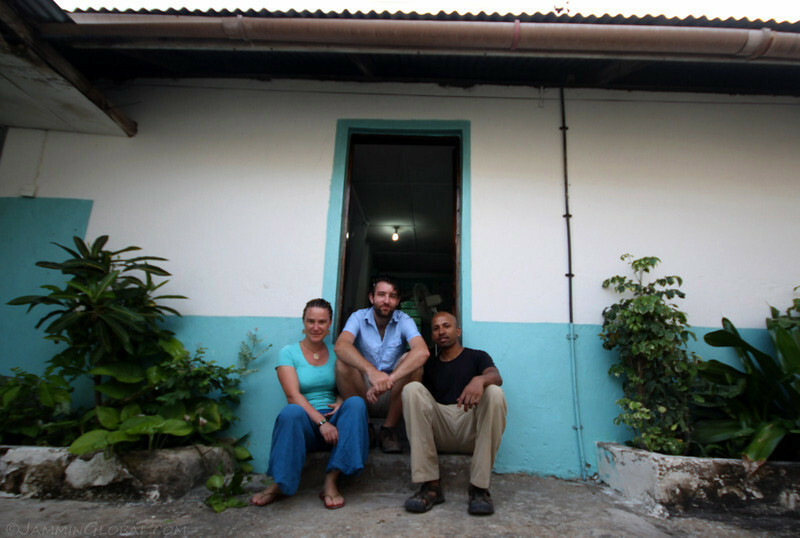 They’re on a mission to make as many trips as they can in a day and that prompts them to take whatever route possible to get to their destination. Driving through Tsavo National Park where it’s the survival of the fittest for the animals and the survival of the biggest for vehicles on the road. 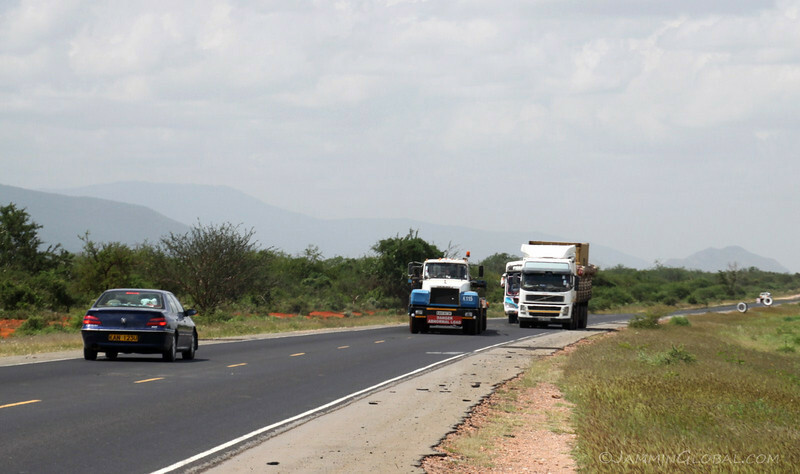 Size matters on Kenya’s highways and if a truck is barreling down at you, it’s up to the smaller vehicle to get out of the way. I cursed at the arrogant drivers the first few times and then just gave in and moved over on to the shoulder. 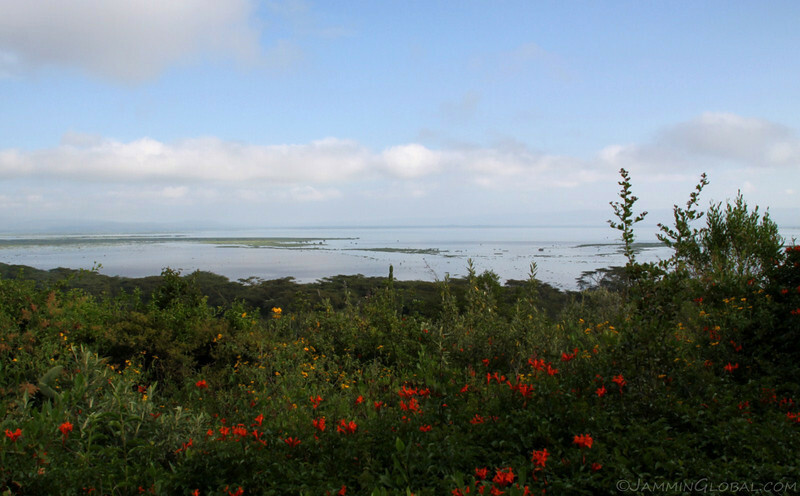 After a few days in Nairobi, I headed north on another road trip with a different bunch of friends towards Lake Naivasha for Christmas weekend. 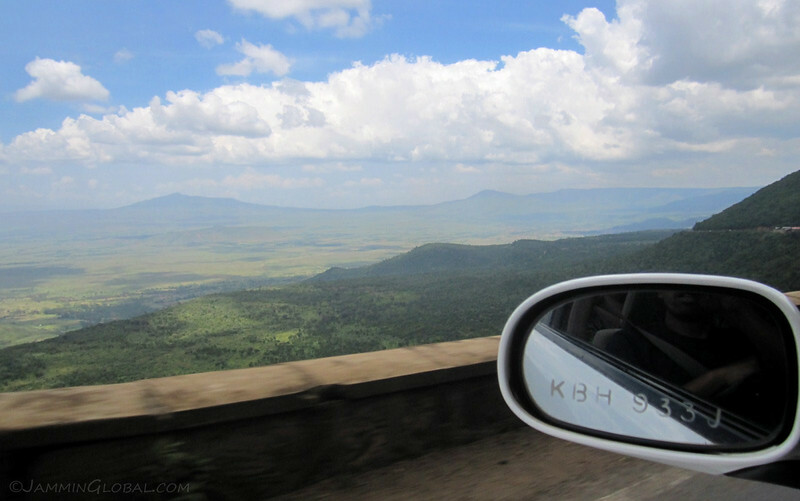 Driving down the escarpment with a view of the Rift Valley below us and Mount Longonot lurking in the background. 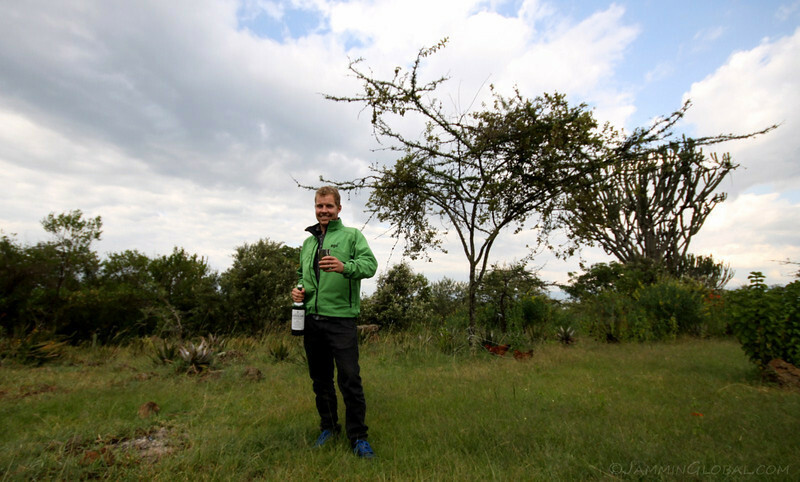 …Jeremy brought out the Laphroaig, a peaty single malt scotch whisky. This was going to be a cooking and camping weekend. 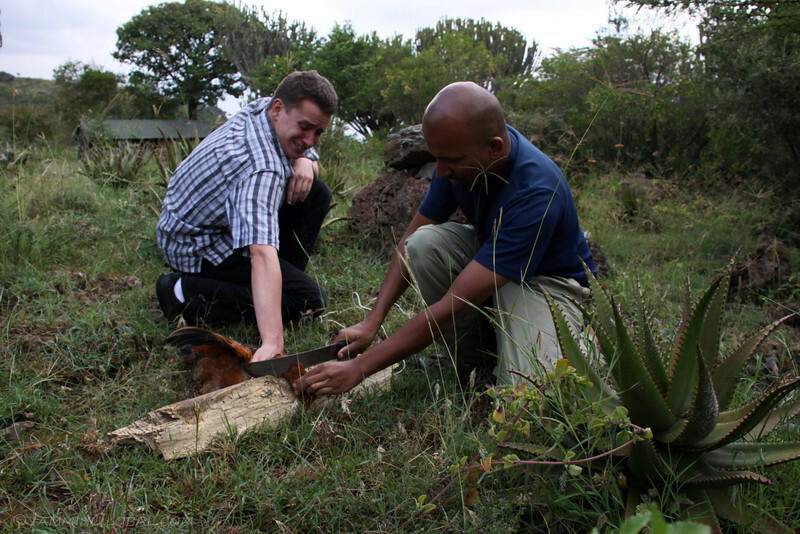 We had two chickens that Richard here brought with him live from his fieldwork station in western Kenya. 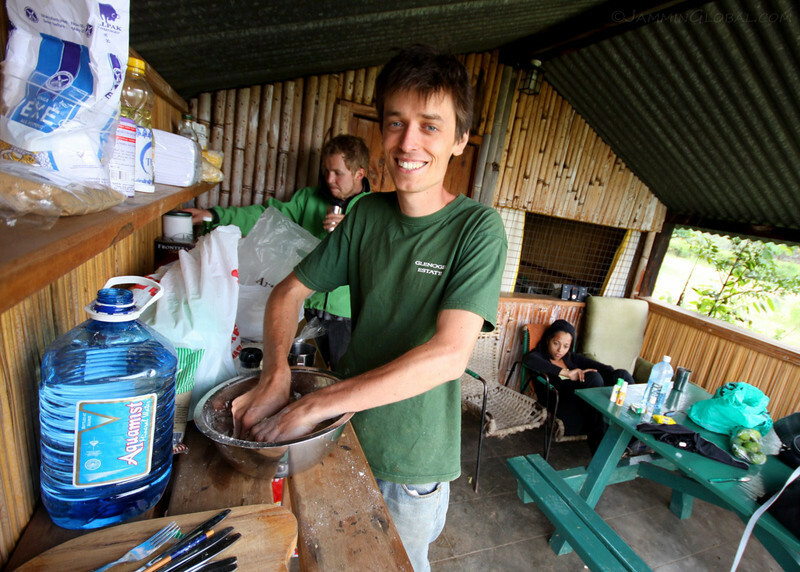 He’s preparing the dough to make some chapatis on the grill for dinner. 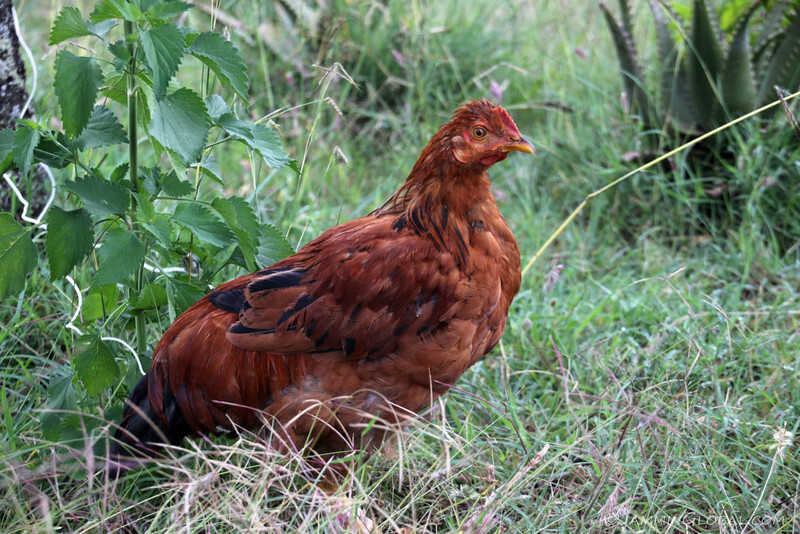 The chicken slated to be our dinner that night. 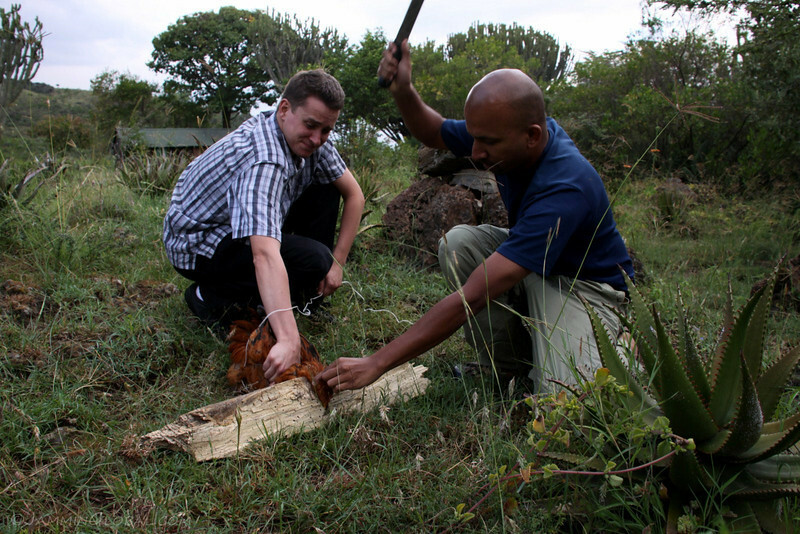 It traveled a long ways from western Kenya and now would serve its purpose in feeding us. …with a swift motion came down right on its neck. That first blow broke its neck but it wasn’t fully dead yet. Another chop and its head was off. Scott and Sarah trying to play it cool while Richard and I cleaned the bird nearby. 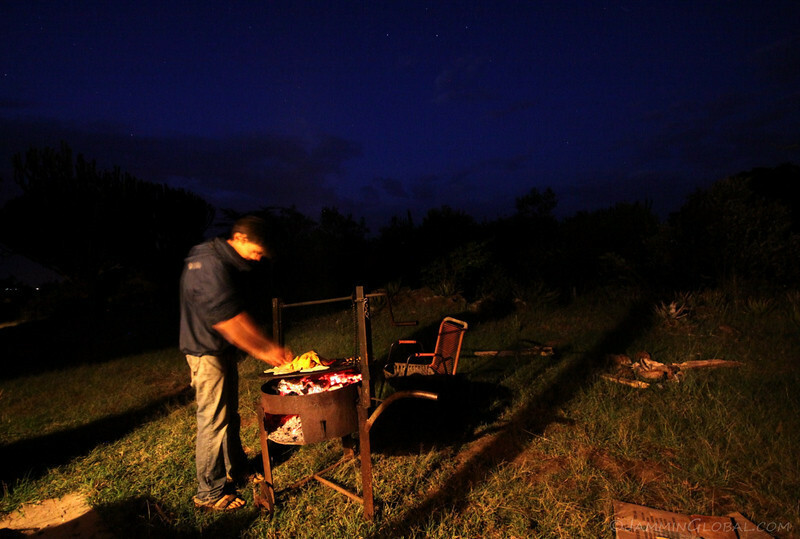 Richard roasting the chicken on the grill. 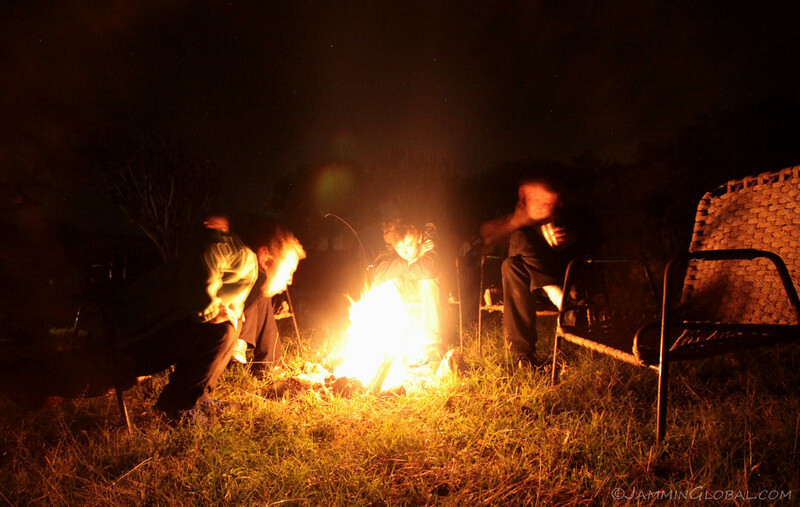 After a delicious meal, we relaxed around our little campfire. 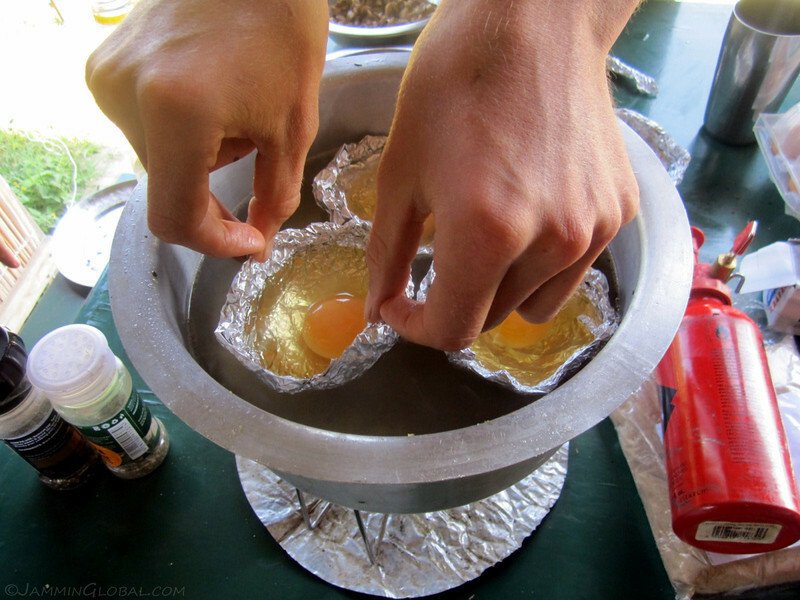 The next morning, Jeremy, who’s quite the chef, was poaching some eggs for a special breakfast creation for his 25th birthday. My MSR camping stove coming in handy. We rented some bikes and cycled around the lake for the day. 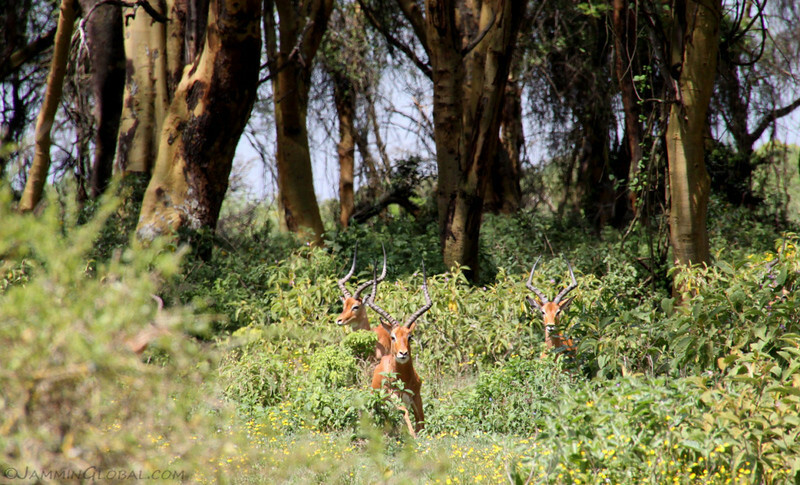 Impala in the bushes around Lake Naivasha. We also saw zebra and baboons. 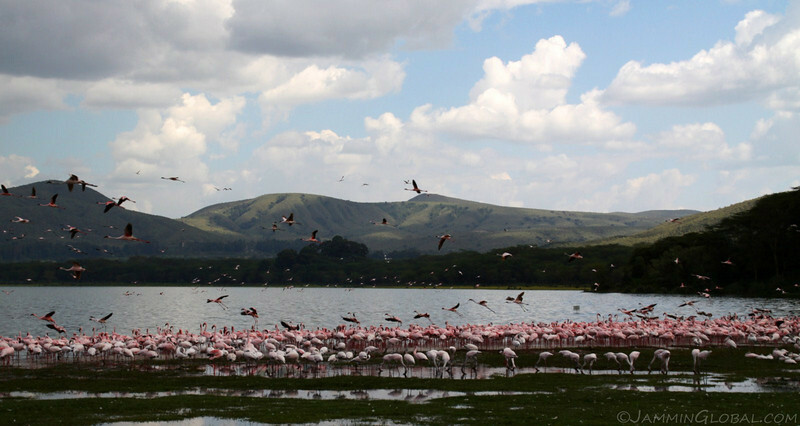 …Lake Naivasha and enjoying pink flamingoes filling the sky. 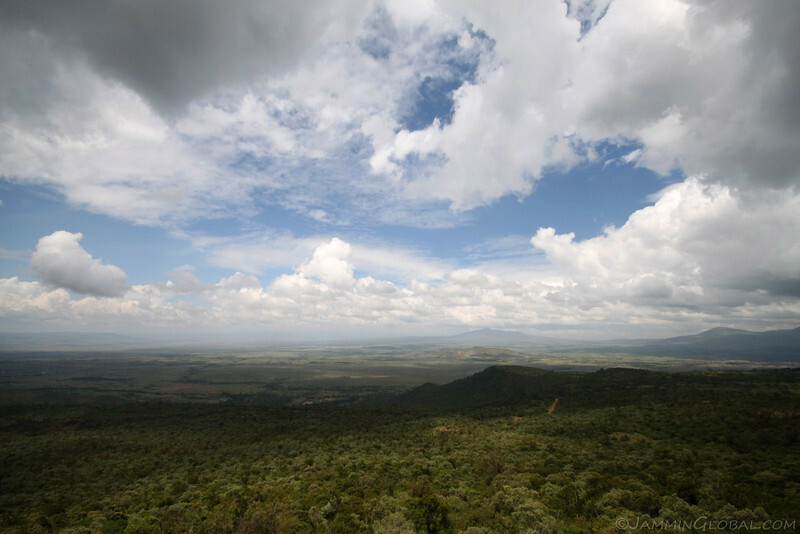 Driving back to Nairobi and capturing a view of the Rift Valley. 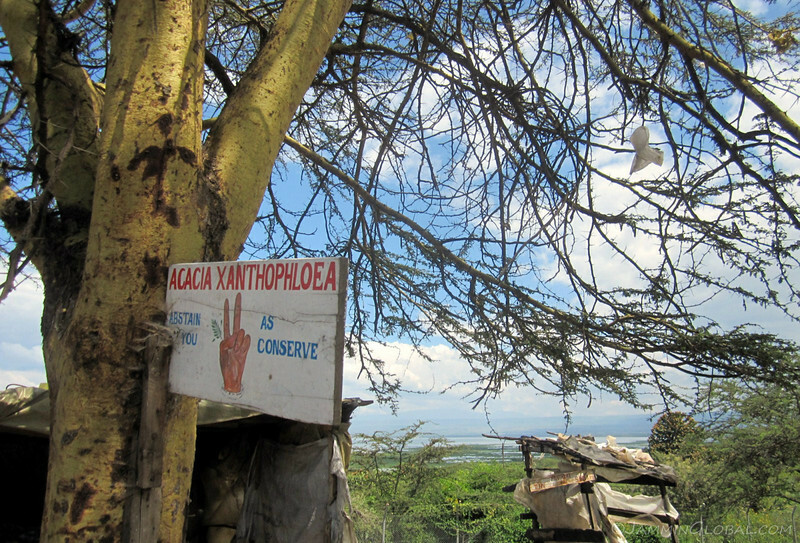 It never gets old, especially with Mount Longonot on the horizon. 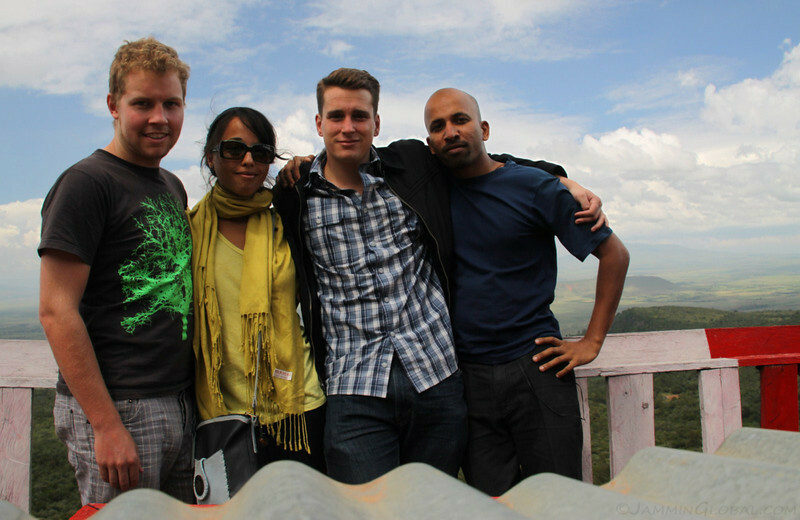 A fun weekend with friends from Nairobi.